In the week the Irish government announced a new tourism drive, I’d better give a plug to the heritage sector. As it happens, last Sunday I spent a very enjoyable day at the Irish National Heritage Park at Ferrycarrig in Co. Wexford. The park, which is located on the banks of the river Slaney in 36 acres of woodland, has a fantastic collection of replica archaeological sites. 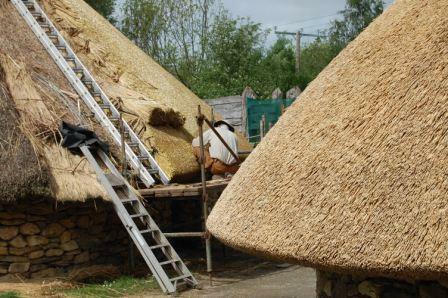 It is currently undergoing a major facelift and this rebuilding work offers a great opportunity to see a wide range of traditional crafts in action. 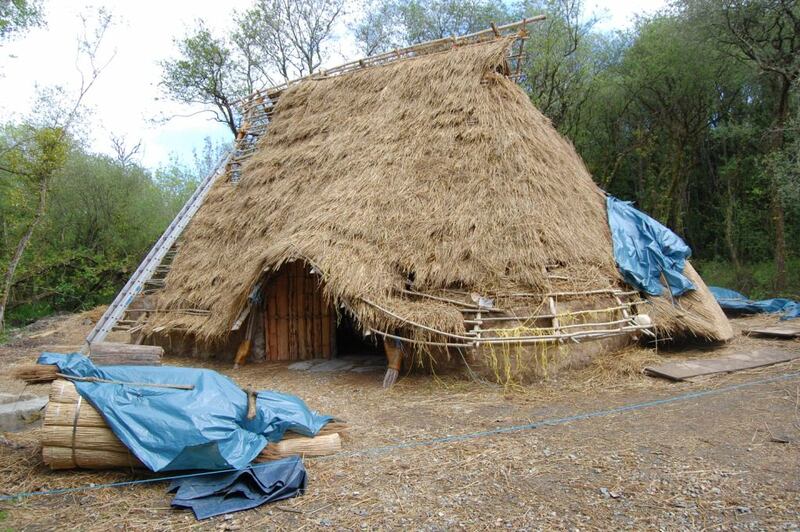 At the moment a brand new Neolithic house is nearing completion. The structure is a large rectangular building of post and wattle construction, with a magnificent thatched roof that is reminiscent of an upturned ship’s keel. Internally the wood workers are in the processing of adding a loft, which would make this Neolithic house a two storey building. The construction work is being undertaken by Muintir na Coille, a co-operative of craftsmen drawn from all over Ireland, advised by Ronan O’Flaherty of Crane Bag Consulting. Jessica Smyth and Aidan O’Sullivan of UCD have also had an input into the design of the house. 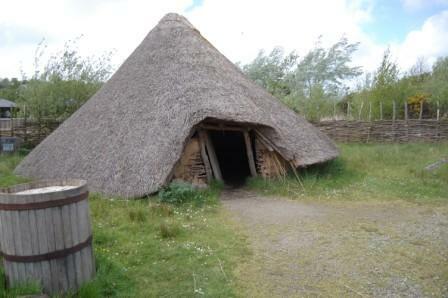 The ringfort site is equally impressive and when we visited the thatcher was on site repairing one of the roundhouses. The Heritage Park intend on making the ringfort available to rent for short stays and parties, which would be pretty cool. 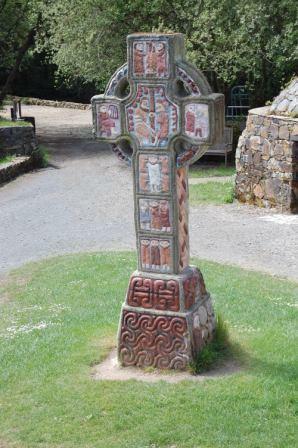 The other sites at the park include a corn drying kiln, a monastery, with a brightly coloured high cross, an early medieval horizontal water mill, a crannóg and a Viking house and ship, which are aptly located on the banks of the Slaney. Unfortunately the Park also contains a questionable concrete breeze block ‘recreation’ of motte and bailey castle, which will hopefully get a serious make over in the ongoing programme of works. 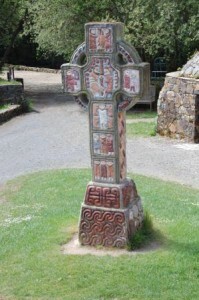 The Irish National Heritage Park has a good working relationship with professional archaeologists, especially the UCD School of Archaeology, who are currently studying the crannóg site. The crannóg has been ‘abandoned’ as part of a research project with some parts being allowed to decay, while others will be deliberately burnt down. Already they have had some interesting results. As the crannóg houses decayed, they noticed that some began to slip to one side. This meant the hearth was no longer under the smokehole and this probably explains why on some excavated sites the hearth seems to ‘move around’ the house. As the house collapsed the inhabitants just kept moving the hearth to stay under the smokehole. Excavation will follow and the crannóg will then be fully reconstructed anew, possibly with a huge central roundhouse c. 15m in diameter. Experimental archaeology programmes have also been carried out at the park, including Smelt 2010. This saw a group of archaeologists constructing an iron smelting furnace over the course of a weekend, under the guidance of Brian Dolan. You can see more about this at Brian’s blog Seandálaiocht or on Youtube. There are also some genuine archaeological remains at the Heritage Park in the form of a promontory fort, which can arguably claim to be the earliest Anglo-Norman castle in Ireland. It was constructed by Robert Fitzstephen in 1169 just after the Anglo-Normans arrived in Co. Wexford at the behest of Diarmaid McMurrough. The fort has a spectacular setting located on a high bluff overlooking the river Slaney and is defended by substantial rock cut ditch, 7m wide and over 2m deep, with steep cliffs on the other three sides. Unusually, within its interior are the remains of an impressive replica round tower, built in the 1850s in remembrance of those who died in the Crimean war. All in all, for anyone interested in archaeology or just a nice walk through some beautiful woodland, the Irish National Heritage Park comes highly recommended.